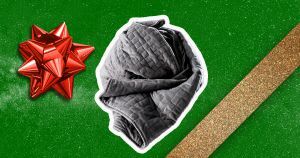 When you give the Gravity Blanket as a gift, it’s like giving the recipient a great big hug every night before they fall asleep. That’s because the Gravity Blanket is a premium, weighted blanket engineered to be around 10-percent of your total body weight. This extra weight relaxes the nervous system by simulating the feeling of a hug, and promotes a more resultful, deeper sleep. The Gravity Blanket’s gridded stitching keeps internal micro beads evenly distributed, which prevents the weight from shifting and clumping in one place. The blanket also features a soft, removable, microfiber duvet cover which is also available in Faux Fur. And when the Gravity Blanket is paired with the Gravity Weighted Sleep Mask and/or the Calm app, you’ll get an even better night’s rest. Check out all the Gravity products here. Futurism fans: To create this content, a non-editorial team worked with Gravity, who sponsored this post. They help us keep the lights on. This post does not reflect the views or the endorsement of the Futurism.com editorial staff.